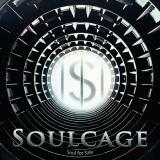 Soulcage is a Finnish band that labels itself as a ”rock ‘n’ roll machine”. To lazily copypaste some more from their website, they proclaim that “addictive radio friendly sound and diverse mix of metal, rock, pop and progressive styles are ways to describe Soulcage”. Soul For Sale is their second album and is pretty well described by the aforementioned litany of genres. The album begins on a very high note, as Flaming Flowers (Send In The Clowns) rocks away with mighty speed and an extremely catchy chorus. Singer Aleksi Parviainen has a quite distinct voice that mostly brings to my mind Kärtsy Hatakka of Finnish prog rock maestros Waltari (Indeed, might not say much to many of you). I guess his slight nasal or the quirkier tones he uses throughout the record echo the great Mike Patton – not a bad target to emulate. The band plays tightly with the guitar and keyboards riding the tight rhythm section very well. Then the record goes on a strange, four-song stretch of mid-tempo mediocrity. I say strange because the tunes aren’t bad at all but seem to lack the punch that the opener displayed. Good-time hard rock, fairly straight-forward with nice melodies does it’s best to keep the listener attached to the speaker, but I’m not convinced. Up sixth, Satellite Children switches gears to the better and towards solid Whitesnake-balladry. Seriously, upon the first listen the first bars made me dead certain that first it was a cover of Is This Love and then Here I Go Again. It's neither, of course. Parviainen sings appropriately lower on this song, going for a more emotional croon. The familiar comparison-vibes continue with Bleeding, that starts like every fist-pumping rocker you’d expect to find playing during a Rocky-training montage. It’s not ripping off Eye Of The Tiger or Burning Heart but the marching, adrenaline-raising atmosphere is definitely there. Another swerve comes with Origin and Stranger In You that take the aforementioned Pattonism to a new level by adding proggish vibes to the rhythmics and especially back up vocals that just scream Faith No More. Coincidentally or not, both tunes are excellent. You Get So Alone is a definite tune for driving around at dangerous speeds - probably the heaviest track on the record with some raspy vocals making things darker. It unfortunately eclipses the final song, MIA, which would’ve served the whole package better by being placed earlier on the song list. This groovy number would’ve spiced up the mid-tempo stretch in the first half really effectively. As you can tell, Soul For Sale is a very versatile collection of different elements that should feel either like an innovative style of hard rock or a jumbled bag of ambitious ideas, depending on you preferences. Personally, I feel that the best songs here are the ones where the band has reached beyond the “easier-to-digest” mid-tempo rock song and dared to bring their prog influences to the forefront. Soulcage has definite potential so I hope that in the near future, they find a more solid mix between the very different worlds of rock they dabble in here.